DESCRIPTION: The BHTV is producing a stunning range of military and intelligence history videos. The team features former soldiers and battlefield guides working with historians and re-enactment groups. The result is that a colourful absorbing presentation is achieved that provides depth to the history and benefits from a soldier’s eye for terrain which so strongly influences the choice of battlefield and the conduct of the engagement. For many viewers, the first introduction may well have been the “Sharpe” stories that have made such popular novels and been turned into exciting films for television. Well-researched though these tales may be, they are fiction and the author was free to turn history to creative advantage. This DVD provides detail beyond what is possible and desirable in a novel and sets the story of The Rifles into its true historic perspective. Shot on location in Iberia, the DVD includes explanations by re-enactment enthusiasts of the uniform and equipment of The Rifles and how they fitted into the British Army deployed to Portugal. Their faithfully reproduced equipment demonstrates how The Rifles operated in Iberia. BHTV has been working through the Revolutionary and Napoleonic Wars with a series of beautifully produced DVDs in a number of series. This DVD is part of The Peninsular Collection and where ever a viewer starts into the series, it is likely to become an enduring interest and require the acquisition of all of the DVDs in this series and in the related series of the period. One of the great achievements of the BHTV team is that each series and each DVD in a series is the product of a combination of researchers, presenters and guides that is a close fit with the subject, including officers who have served in the successors to the units covered by the DVD collections. The level of knowledge and pride in the subject is something that is never achieved in the many history series made for television broadcasting, because the presenters do not usually share the enthusiasm, knowledge and pride in the subjects that the BHTV team demonstrate. 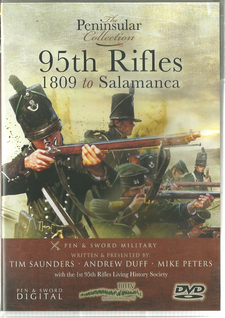 In this DVD, the progress of the Peninsular War from 1809 to Salamanca is followed and the part played by the 95th Rifles is ably shown. It includes the interactions of the principle characters on both sides and the way in which The Rifles and its officers related to the other British Regiments and formations. This period is the story of how the British under Wellesley established their hold on Portugal and the ability to move into Spain, heading for France. 1810 saw Marshal Massena driving the British towards the sea, with the Rifles playing a key part in what was a relatively successful withdrawal, protecting the Light Brigade. 1811 saw the British driving the French back to Spain with The Rifles snapping at their heels and proving the value of a well-aimed rifle above the muskets of the other British and French Regiments. By 1812, with Napoleon occupied in Russia, Wellington took the offensive and climaxed with Wellington and Marshal Marmont seeking to gain a decisive advantage with a great battle on the Plains of Salamanca.